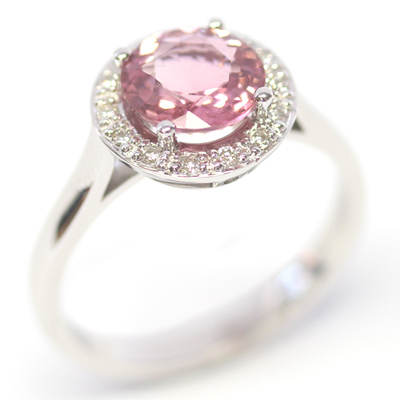 9ct White Gold Pink Tourmaline and Diamond Halo Ring — Form Bespoke Jewellers Ltd.
A pretty pink tourmaline and diamond halo ring cast in white gold. A lovely statement ring. 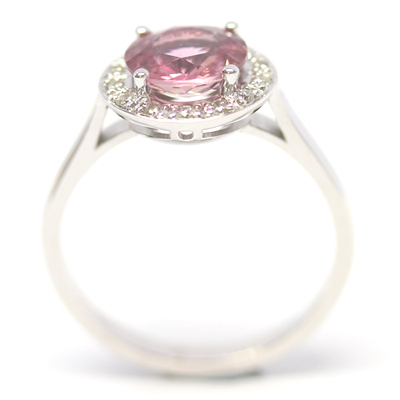 At the centre of this halo design is a raised pink tourmaline, held in place by four neat white gold claws. By holding the tourmaline high in this open setting, it allows extra light to flood the delicate pink stone and in turn creates added sparkle. Surrounding the glittering tourmaline is a halo of grain set, round brilliant cut diamonds. Hand set in a contemporary white gold basket, this tourmaline and diamond halo ring is a real show stopper.